Today for review I’ve got the new Thermaltake Armor A90 gaming chassis. It’s a great case overall, and the price isn’t too bad either coming in at under $100. It’s got plenty of room for larger video cards and a lot of hard drives. The A90 comes with three fans pre-installed, one of the them is a nice large 200mm fan that’s located on the top of the case. The case is well made and it’s fairly quiet and it does a decent job at keeping your system cool. So read on to check out the newest addition to the Armor series of cases from Thermaltake..
As with any Thermaltake case it’s packaged well. The Armor A90 is black, pretty much solid black inside and out. The front has a triangular design, and it comes with one fan installed, but you can add another. Towards the top you’ll find a small door, next to the door is the USB ports, audio ports, reset button and the HDD and power indicators. Underneath the door you’ll find a large triangular shaped power button. When you open the door you’ll find three 5.25” bays and one 3.5” bay. On the left side you’ll find a very small triangular shaped clear window and below that a space for you to install a fan if you want. The right side of the case is solid with the angular pattern. The Armor A90 is all about angles, on the top you’ll find two USB ports and an eSATA port along with a cooling fan as well. Moving to the bottom you’ll find four rubber feet and a filtered space where the PSU would be installed. You’ll also notice four screw holes near the front that are to be used to install an SSD or 2.5” drive inside of the case on the very bottom. Moving to the back of the case you’ll find the usual things, with a fan pre installed and there’s four punch outs for water cooling tubing. There’s also a security lock so you can secure your mouse and keyboard so no one can take it. Ok, let’s move to the inside. Taking the right side panel off you can see the back of the motherboard tray which is cut out to allow for easy CPU Cooler installations. You’ll also find plenty of room by the hard drive bays to route or hide wires if need be, and there’s a large opening between the tray and HDD bays to pass wires through. Taking the left panel off we can see everything else. The hard drive and optical drive bays are all tool-less, they’re flip up locks making installation a bit easier. Then here’s the view of the PSU area, the filter is there but it’s not exactly easy to remove it’s just a wire mesh screen basically. Well now of course I’ve got to put a system in it. This is my HTPC/gaming system which basically consists of C2Q9650, Sparkle Calibre GTX 260, 4gigs of Corsair DDR3 ram, bgears b-enspirer sound card, Physx Card and two hard drives and an OCZ Solid 2 SSD for my OS. The GTX 260 is a fairly large card but it fits just fine. If I had the hard drive up farther though there might have been a problem, so if you’ve got a lot of hard drives and a large video card it might not fit. I installed my SSD onto the bottom of the case, I guess this placement works well as heat rises, and the front fan is blowing air across all of the drives. The front and top fans have blue LEDS in them, I’m not too fond of that really as I use this as my HTPC as well as my gaming system. The fans though are quiet, I could barely hear them really. The fans also seem to do a decent job of keeping my system cool. The case before this was an NZXT one with six fans in it, and the Armor A90 kept the same system only a few degrees warmer with less fans. The LED of the top fan does light up the inside of the case well, with the side panel off it’s really bright and then through the window you can see the blue. The case is very well made, it’s sturdy and I like the fact that it’s black inside and out. I really didn’t have any major problems with it regarding installation either. As I mentioned there might be an issue with larger cards and the hard drives, but most people aren’t going to fill all of the bays. 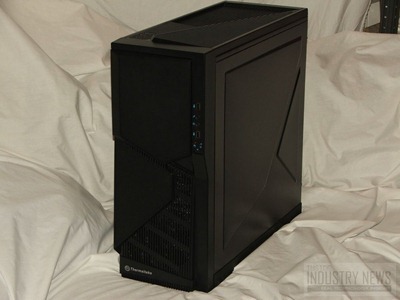 The Thermaltake Armor A90 case is a great addition to the Armor series of cases truly. The case is very well made with a lot of room inside for larger video cards and lots of hard drives. The black on black and angular motif works very well together, it certainly is a unique looking case. If you’re looking for a nice gaming case then I can recommend you take a closer look at the Armor A90. The installed fans are quiet and do a decent job at keeping the system cool, but personally I’d swap them out for non-LED silent fans, and even add a fan or two to the front and side of the case. The windows on the side is nice, but it’s really small and rather pointless honestly in my opinion. If you’re the kind of person that likes to show off your system with a side window then you’ll be disappointed as you won’t be able to see much at all.